Fresh garden herbs and revitalizing mint will wake up your senses. Drop your bath bomb in your bath water and watch it fizz, enriching your bath with moisturizing coconut & mango butter. Enjoy the colorful, fragrant, and skin loving experience! 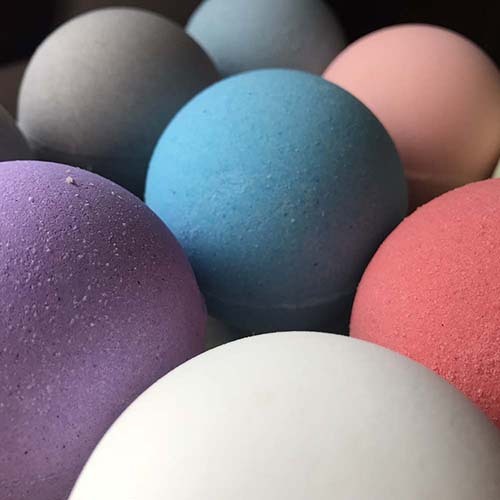 Our bath bombs are unique in that they are jam-packed with moisturizing mango butter, cocoa butter, and grapeseed oil (most bath bombs don’t provide this extra, skin-loving benefit). Nutrient rich mango butter is similar to shea butter, but has a very low potential for allergies and skin irritability, making our bath bombs more useable for people with sensitivities. Our unrefined cocoa butter is very high in fatty acids. Essential fatty acids like omega-3s and omega-6s are the building blocks of healthy cell membranes. These polyunsaturated fats also help produce the skin's natural oil barrier, critical in keeping skin hydrated, plumper, and younger looking. Grapeseed oil, a wonderful source of vitamin E, works as a fat-soluble antioxidant, which helps protect your cells from damaging free radicals. Our bath bombs are safe for children’s skin and your tub. No dyes or sulfates. Because our bath bombs are a handmade product, color and aroma may vary slightly with each small batch we make. Ingredients: Sodium Bicarbonate (baking soda), Citric Acid, Corn Starch (naturally hardens bath bombs and helps make water silky), Mango Butter, Cocoa Butter, Grapeseed Oil, Cream of Tartar (naturally hardens bath bombs), Fragrance, Polysorbate 80 (plant-derived, used to emulsify color and oil with water so it doesn’t stick to your tub), Color. Oatmeal, Milk, & Honey bath bombs also contain Colloidal Oatmeal & Goats Milk.